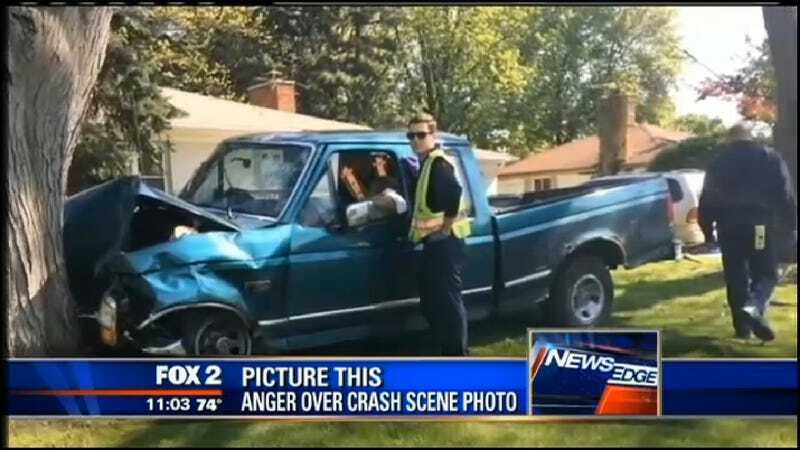 A man in Westland, a western Wayne County suburb of Detroit named after the local shopping mall, is angry with his city's emergency responders after a photo of two workers posing in and outside a truck he crashed started circulating online. 20-year-old Jake Glover tells Detroit's Fox affiliate he was backing out of a friend's driveway when he suddenly blacked out. When he came to, he was told he lost control due to an unexplained medical condition and smashed into a tree, totaling his '90s-era F-150. A neighbor nearby was snapping photos of the wreck, a natural human reaction in the celluar age. She tweeted Glover a photo of what appears to be two paramedics smiling — one outside the truck "striking a little pose, hand on his hip," the other smiling while holding Glover's body slumped over the steering wheel. The photos were brought to the attention of Westland's fire chief, who disputes that the paramedics weren't smiling and were following normal procedure. A few commenters on the Fox story note that it's possible the two medics' name were called at the moment the photo was taken and that the one inside the truck appears to be keeping Glover's spine upright. It hasn't alleviated Glover and his friends, who fired off on social media about the incident. "You should be tending to someone who obviously needs your help, instead of worrying about someone taking a picture," Glover's friend, Tayler Mihailoff, tells the TV station.